The US Federal Energy Regulatory Commission (FERC) has issued favorable environmental assessments for two projects associated with the Corpus Christi Liquefaction Project. Corpus Christi Liquefaction Stage III LLC filed its application to site, construct, and operate an expansion of the Corpus Christi Liquefaction Project, which had already been approved and is under construction. The proposed expansion of the Liquefaction Project consists of the addition of seven midscale liquefaction trains and one liquefied natural gas (LNG) storage tank. Corpus Christi Liquefaction LLC is currently constructing the Liquefaction Project and will provide interconnects between the Liquefaction Project and the Stage 3 LNG Facilities, as well as control building modifications to accommodate the Stage 3 LNG Facilities. The marine facilities and certain other support infrastructure authorized for the Liquefaction Project will be shared with the Stage 3 LNG Facilities. The modularized construction of the Stage 3 LNG Facilities will allow for individual trains and associated facilities to be constructed and brought online in a phased approach, in response to market demand. The first phase of the Stage 3 Project is expected to brought online in 2022. 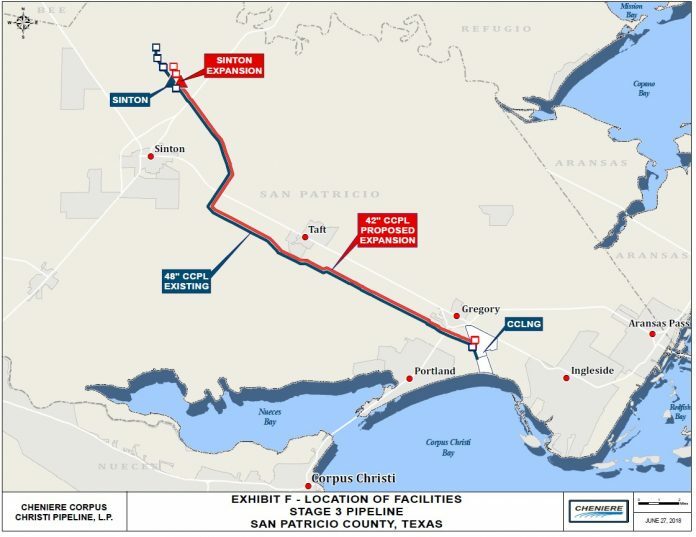 Cheniere Corpus Christi Pipeline LP (CCPL) submitted an application to construct, own, operate, and maintain new interstate natural gas pipeline, compression, and related facilities in San Patricio County, Texas, USA (collectively the Stage 3 Pipeline). The Stage 3 Pipeline, which will be approximately 21-miles (33-km) long and 42-inches (1066-mm) in diameter, will originate at CCPL’s Sinton Compressor Station and generally run parallel to CCPL’s existing interstate natural gas pipeline and will be capable of supplying feed gas to, and bringing natural gas from, the Stage 3 LNG Facilities. The Stage 3 Pipeline will be integrated and operated as part of the Corpus Christi Pipeline system. The favorable environmental assessments from FERC allow each project to proceed. The Stage 3 Pipeline will be capable of transporting an average of approximately 1.5 Bcfd (42 x 106 m3/d) of natural gas to the Stage 3 LNG Facilities, as well as transporting natural gas from the Stage 3 LNG Facilities to interconnections with existing natural gas pipeline systems. The pipeline will be designed for a maximum allowable operating pressure of 1440 psig (99 bar). The Stage 3 Pipeline will require additional compression at the Sinton Compressor Station, namely the addition of approximately 44,000 hp (32,824 kW) via two Solar Turbine Titan 130E gas-fired compressor units. The Sinton Compressor Station, including the facilities to be added for the Stage 3 Pipeline, will be operated remotely. One metering and regulating (M&R) station will be installed within the Stage 3 LNG Facilities and two M&R stations will be installed within the Sinton Compressor Station.